If it's slim pickings in the bloom department now for my garden, I can't imagine how bad it'll be for next month's Garden Bloggers Bloom Day. 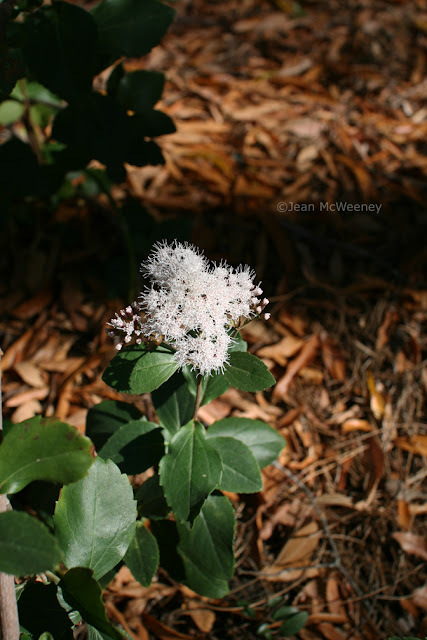 This month I get to feature my oddball shrub, the viburnum mistflower or Joe-Pye shrub, Eupatorium viburnoides. This is NOT a Joe-Pye weed and it's NOT a viburnum. In fact, I have never been able to find out much about it other than it's native to Mexico. Regardless, I've had this for two winters now and it's always bloomed in late November through December. It has a very light fragrance and the leaves are evergreen. Sounds pretty good, yes? Well, it has one habit I'm not that fond of. It's very lax and floppy. Not really like a shrub at all. But maybe that's because I don't know how to train it properly. Or maybe it needs more sunlight (it gets blasted by the sun in the late afternoon but has light shade before that). I plan to give it a very good pruning after it finishes blooming and hope for the best next winter. Now, I'm hoping to see more blooms than this at Carol's website, where she hosts Garden Bloggers Bloom Day! That's better than here. Nothing is in bloom here, except for our indoor hibiscus. Eupatorium viburnoides is a new plant to me, Jean - but it must be tough! My fragrant white mistflowers were frizzled by the frosts. Hope January brings you some nice surprise! A Joe Pye Viburnum that is neither Joe Pye nor Viburnum? LOL plant names can be so confusing sometimes. It's very pretty anyway. That mistflower certainly looks like a winner. I have to search it out. All my ordinary mistflowers are gone with the frost. It looks like boneset, Eupatorium rugosum. It's a pretty thing for a dull time of year. If you can figure out how to control it, you will have a nice December addition to your garden. Even flopping I liked its soft flowers against the shiny leaves. I think it is a Joe Pye... just not the most common one (Eupatorium purpureum)? They're all eupatoriums. I never heard of this one before today and I think it is really cool, especially if it blooms so late in the season. It has the same crazy habit as my sage buddleia though -- I can never get that thing to look pretty in anything but a close-up. 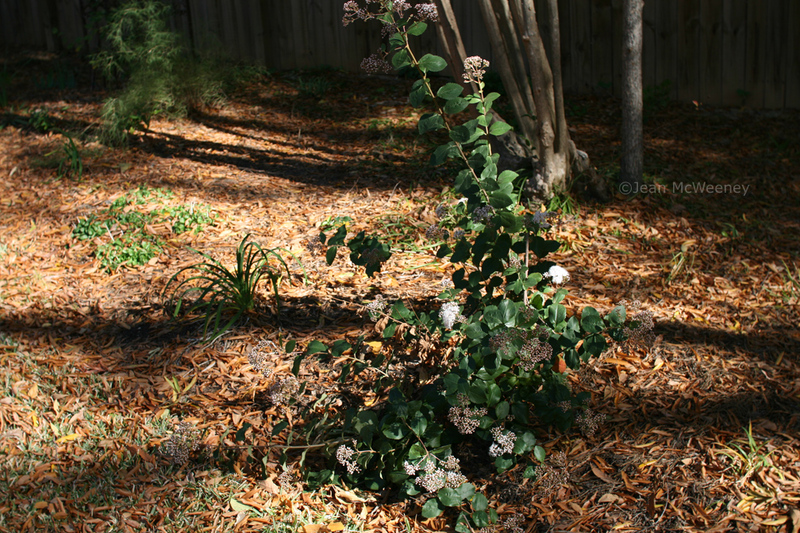 Jean - one of my fellow Austin garden bloggers, R Bell, seems to grow the same plant, calling it Joe Pye Shrub. That's it! I couldn't remember the scientific name (always makes me grumpy when I lose track of that). This past spring, I decided to snip about half the limbs back 50%, and it seems to have reduced its sprawl (though likely some of my sprawl is shade related) & tightened it up some without reducing its bloom production. You have a beautiful garden and garden blog. It's my first time to visit and I will certainly come back in the warmer months to see what's growing. Does your little shrub have drupes after it's done blooimg? It looks just like a viburnum lentano that I have growing in my garden. Mine is a small tree that blooms in the spring. It's not evergreen for me in zone 7A, but could be for you since you're so much warmer. Or it could be a eupatorium you're just not familiar with. Either way, it's pretty! Thank you for all your comments on my unusual shrub. And thank you Annie for telling me about R Bell's plant. It is indeed the same plant. And it's no wonder because I bought the plant at Barton Springs Nursery in Austin. This plant has leathery leaves and woody stems, is evergreen, and only blooms in late fall/early winter. If you google the botanical name, you won't find much info on it! I plan to do what R Bell did to his to tighten it up a bit. It's now looking a lot prettier since all the blooms have opened up. It's a nice white pop in a brown landscape. Darn, I meant to also reply to TS that it doesn't get any drupes after flowering. At least, not that I've seen so far. I love the fragrance of Eupatoriums. I'll have to look for that one at BSN next time I'm in Austin! A belated visit to your bloom day post.. cool to see that we're both fans of Joe Pye! You have one more bloom than I do. So see, you're lucky. I like your "oddball shrub", especially the dark green shiny leaves. Warm wishes for Christmas and a Happy and Healthy 2011. Just a minnow - isn't Eupatorium perfoliatum 'boneset'? I love the wondows with lants in front - green in the wrong way!